Compliance Auditing and Risk Assessment | iSecurion Technology and Consulting Pvt. Ltd.
With establishment of new rules and regulations internationally and adaption of new business models the need for regulatory compliance has significantly increased. Any organization small or big have to comply with these regulatory and compliance requirements nationally or internationally to comply with industry best practices. Establishing a regulatory compliance is not the end of job, rather an organization has to adapt to the continually evolving regulations and maintain them. 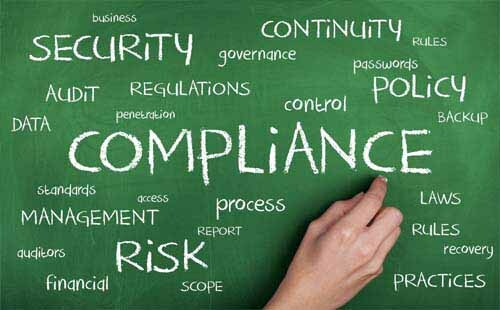 One of the main processes of any Regulatory compliance requirement is comprehensive Risk Assessment. Risk Assessment helps in identifying and evaluating and controlling risks related to the organization’s objectives. Isecurion helps clients in conducting a comprehensive and robust Risk assessment for meeting the objectives of regulatory and compliance requirements. We also provide extensive support to organizations in establishing major Information Security compliance requirements like NESA, ISO 27001/20013, PCI DSS, and HIPPA etc. Identify compliance gaps in your existing environment. Provides customers and stake holders with confidence in how you manage risk. Ensures you are meeting your legal obligations. Reduces information Security incidents related to data breach etc. Provides increased confidence for better business decisions. Save money by focusing on effective controls and appropriate levels of protection. Continued business in case of unforeseen circumstances or emergencies. Maximizes your security Return of Investment. Identify the business requirement and the business units in scope. Identify the key business processes. Review regulatory and compliance rpolicies and procedures related to these processes. Interview key personnel and asset owners within your organization. We perform gap analysis and review existing policies and procedures. Review existing metrics which are used as part of Governance. Conduct a comprehensive risk assessment based on the identified scope. Provide comprehensive report detailing the risks identified and necessary remediation controls. We also support customers in remediation of the identified gaps based on our findings and help them enhance their policies, procedures and security controls as per the compliance requirements.